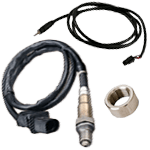 In this section you can find our range of parts and accessories for oxygen sensor products, such as replacement sensors, cable extensions & adapters, exhaust bungs etc. Not a very exciting section of the web site, sometimes the spare parts we need to buy for our cars aren’t very exciting. We only stock genuine Bosch sensors and only the 4.9 models. We aren’t stocking the older 4.2 sensors as we feel if people are still running the older models it’s possibly a good time to upgrade to the latest 4.9 sensors as they bring many benefits over the older models, such as longer lifespan and faster response rates. Here we have brand new genuine Bosch 17025 4.9 oxygen wideband sensor, EU model code 0 258 017 025. .. Here we have a high quality stainless steel oxygen sensor exhaust bung with a stepped edge which mak..